What a difference a week makes - from below zero temps and ice galore to spring-like weather (yes, it soared to 60 degrees in parts of Connecticut yesterday). We have experienced a true meltdown in New Fairfield. While this drastic fluctuation weather conditions offered New Fairfield residents a welcome reprieve from old man winter, it comes with a price (and sometimes our vehicles pay it). You guessed - the structural failure of the very roads we travel on - POTHOLES. 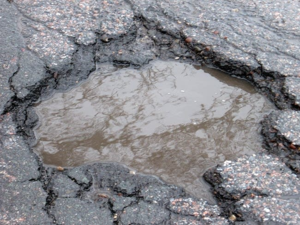 According to AccuWeather, as temperatures rise following cold and snowy winter weather, potholes can become a costly and unwanted roadway headache for motorists. The potholes form after snow or rain seeps into the soil below the road surface. When moisture freezes as temperatures drop, the ground expands and pushes up the pavement. Potholes can cause accidents and damage to your vehicle. You can help local and state highway departments by letting them know where you have come in contact with the dreaded road hole. This way, they can send their crew to fix the pothole. If you would like to report a pothole on a state road, click here to notify the Department of Transportation (DOT) using their electronic submittal form. State roads include the interstates, parkways, expressways, and other major roadways maintained by the agency. Report potholes on Local roads to municipal representatives through your individual town or city website. Click here for additional information.